Spring tides Weymouth wrecks producing good Pollock catches to lures. The PACreationz weekend was one of several first experiences for me. My first Broadland pike, my first pike boat trip and the first time that the Fire Brigade has radioed the police to enquire about my catch! As a young angler, here is my take on the event. 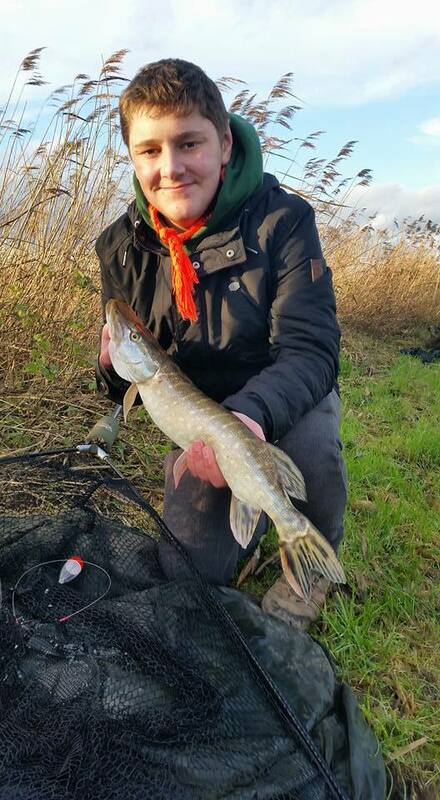 Since joining the Pike Anglers Club in the autumn of 2015, I have learnt many effective ways to catch pike, and more importantly had the opportunity to practice the safe unhooking and handling of pike under the supervision of PAC coaches. 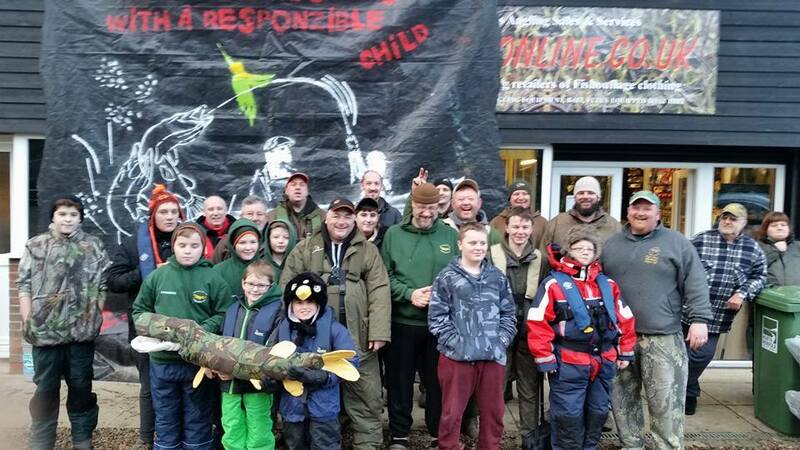 The 10th January saw eleven young pikers and a team of dedicated coaches meet at Bass Online in Horning ready for a day’s piking on the Broads. Like many other juniors, I was extremely excited, as the day presented the opportunity to fish from a boat, something I had never experienced before. The day was split into two halves, allowing everyone a chance to try fishing from both boat and bank. I was selected to go out on the boat first, so after being given life jackets and shown how to correctly put them on, we set out onto the water. The coach in our boat was Dave Mutton, and he showed us how to rig up for trotting livebaits, before we cast out and hoped for a bite. Dave explained how it was important to keep moving and locate fish, and after trying several spots, one of the floats sailed away. Eight year old Keaton Young was the first to score, and after a good fight, I slipped the net under a lovely fish. 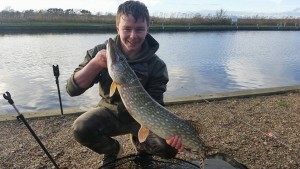 He was shown how to properly chin the pike, before lifting it for a few pictures and returning it to the water. 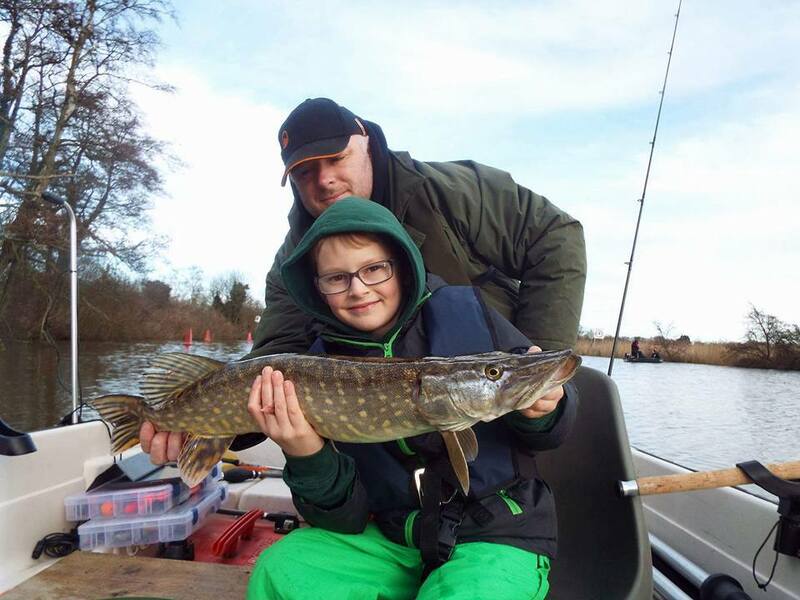 Whilst we were fishing from the boat, young pikers under the supervision of Norfolk legend John Goble had also got in on the action. Bank anglers used a mixture of live and dead baits as well as lures to catch the fish, and by lunchtime several fish had been landed, leaving me with high hopes for my afternoon’s bank fishing. At midday, we stopped for lunch, before the boat and bank anglers swapped over. It is worth mentioning the hospitality of Steve and Jo at Bass Online, who generously provided food and accommodation to juniors and coaches in their home at their own expense. That afternoon was one to remember and not for angling related reasons. 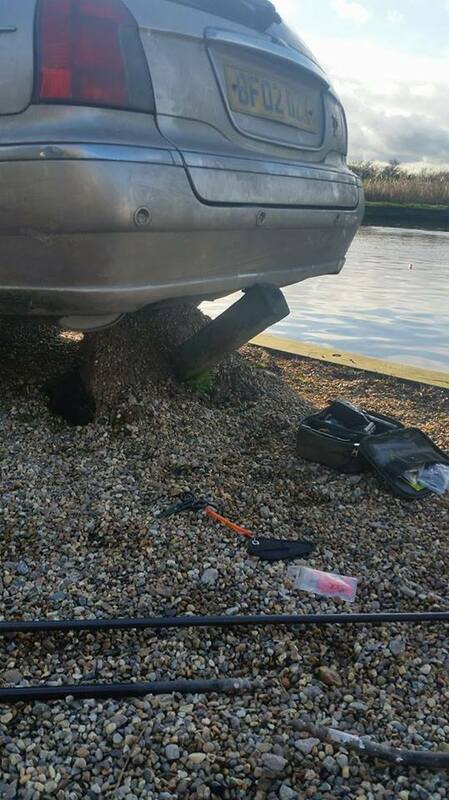 A member of the public got his foot stuck on the accelerator while reversing in a nearby car park and narrowly avoided smashing thousands of pounds worth of rods and ending up in the water! I was sitting on a bollard listening to Coach John Pollen as he set up a paternoster rig when the incident happened. 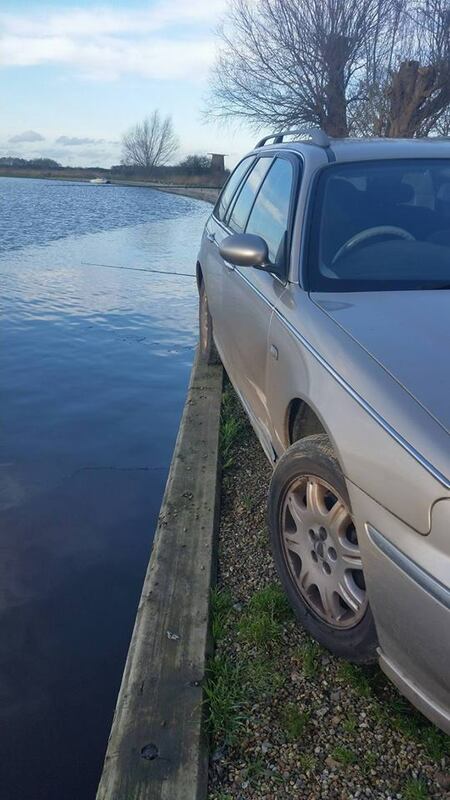 When I saw the car begin to accelerate I jumped out of the way, and very fortunately the same bollard stopped the car from going any further, preventing a collision with John, his gear, or the water. Following the accident, police and ambulance crews had arrived and begun taking statements when amongst all the chaos, a pike grabbed my roach, leading to a short scrap and my first Broadland pike on the bank. It is at this stage I must give a huge amount of credit to John, who despite still being very shaken, managed to remain calm and talk me through unhooking the pike, which had taken the bait quite deep. News of my catch quickly spread, and the Fire Brigade who were still on their way significantly lightened the mood by radioing the police officer to ask how big the pike was! After a few pictures, I had the pleasure of watching the fish swim away, before resuming fishing for the afternoon. Understandably, John didn’t feel up to setting up more rods, so I carried on with one rod, doing some lure fishing to pass the time. Despite having one dropped run on a livebait, I didn’t manage any more fish, however after a quick move, Luke Young caught a small jack to finish the day. The boat fishing that afternoon was slow, and although coaches and juniors worked hard, no fish were landed. I think speak for all the PAC youth when I say that we had a great day and are extremely grateful to all the coaches, parents and organisers whose hard work and dedication made the event possible. I highly recommend any other young people who want to start piking get in touch with your local PAC branch and go along to one of the great events organised by the club.